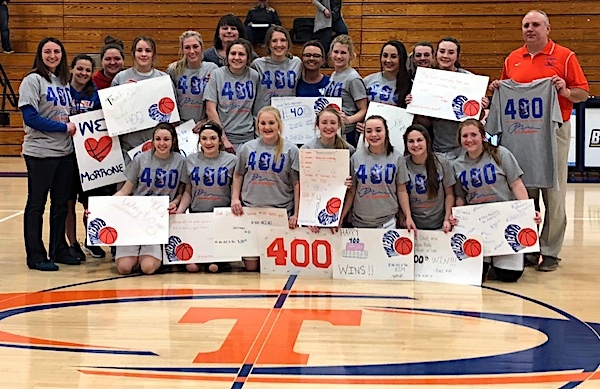 FORT GAY, W. VA. — Tolsia Head Coach Ric Morrone racked up win number 400 after the Lady Rebels ( 9-3 ) defeated Calhoun Co. 60-43 on Saturday afternoon at Rebel Arena in the West Virginia Hometown Invitational Tournament. Tolsia is 2-0 in Pool Play with one game to play against St. Mary’s on Saturday at Home at 4:00. Sarah Jude led a trio of Lady Rebels in double figures with 24 points, Julie Boone tallied 17 points and Lynndsey Cassell finished with 11 points, Kylea Pollinger chipped in with 4 points, Trinity Muncy, Selena Browning and Jace Litton had 2 points each. THS hit 6 three pointers and went 2-6 from the free throw line. Lost Creek, W. Va. — Tolsia made the three hour road trip and opened up with a win in pool play of the West Virginia Hometown Invitational Tournament on Thursday evening. Julie Boone led the Lady Rebels with 10 points, Sarah Jude and Selena Browning 8 points each, Katelyn Kelly 6 points, Lynndsey Cassell 4 points, Trinity Muncy, Elizabeth Johnson, Jace Litton, Taylor Ball, Isabella Simpkins, and Kylea Pollinger had 2 points apiece. The Lady Rebels will return to action on Tuesday with a trip to Grace Christian, Thursday at Van.